LIBERTY – The day of any high school cross country state meet can be both challenging and emotional for the athletes and their families, obviously more so when multiplied by four. 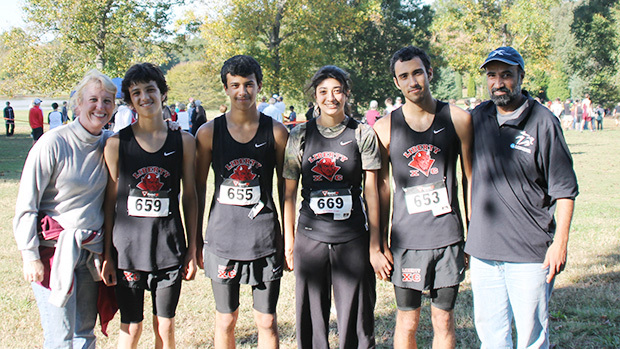 Four students, three boys and a girl from the Balawi family, will step onto the cross country course at the Sandhills Research Center in Columbia on Saturday as members of the Liberty High cross country team. The family and the team will be led by senior Abraham Balawi and junior Hanan, along with eighth-grader Adam and seventh-grader Mismeh. Abraham is considered among the favorites to take the SCHSL State Class AA championship tomorrow based on his first-place finish last weekend at the Upper State Championships at Hillcrest High, while his younger sister, Hanan, should do well on the girls’ side after finishing 11th at Upper State. Having four of their children competing at State this season is obviously special for the Balawi parents, Abballah and Shannon. “It’s a dream come true,” Shannon recently told scrunners.com. The Balawi family has “always been active” in sports – cross country, track and others – interests they certainly picked up from their parents. Shannon, who now teaches at Liberty High, lettered in four sports at the school, including track. The couple met in Liberty in 1995, married and moved to Virginia in 1997. The family moved back to Abballah’s native Amman, Jordan, in 2002 before returning to Liberty four years ago. “While we lived in Jordan, the kids played team sports with the Amman Little League; baseball and soccer,” Shannon said. Abraham started running track after the family returned to Liberty and picked up cross country in ninth grade. Since then, the younger siblings have essentially followed that path, though Adam has played football and Mismeh summer basketball. Though Liberty’s cross country program has lacked consistency over the past several seasons, Shannon said her kids received support over the years from coaches at nearby schools and from former Spartanburg Methodist College and Blue Ridge High coach Mike Foley. “Mike knew the kids back when they were first running and he has always supported us,” Shannon said, holding summer workouts with them and putting together training schedules. “They’ve all been influential with support, motivation and building a mutual respect between runners and teams,” she said. Shannon said having four children competing in the same sport, on the same team and in the same season “has been rewarding and challenging,” but manageable with a healthy mix of humor. She said the experience has brought the family closer together. “We have our pre-race pasta meal together at the crack of dawn, and traveling together and eating out is really a lot of fun and helps to unwind after a stressful meet or a long trip,” she said. The family typically will let the child who runs a PR at an event choose the restaurant that evening, she said, “and their dad always chooses his “hero” of the race. “This has nothing to do with running times, but with their performance, attitude and heart,” Shannon said. This season, Abraham’s last as high school competitor, has been one the family has been waiting for and dreading. “It is bittersweet for me,” Shannon said. “I’m sure we will be filled with all kinds of emotions on Saturday.